Finally, Robbie Williams has confirmed he is working with Take That again and a band reunion on stage IS on the horizon. ROBBIE RETROSPECTIVE: LOOK BACK AT MR WILLIAM’S MANY LOOKS HERE! Is Robbie harbouring a little secret? We have a sneaky suspicion the singer will be joining the boys for a public performance sooner than we think, when Gary Barlow kicks off this year’s Children in Need with a star-studded concert at the Royal Albert Hall. Put together by Gary himself, the show will be aired live on BBC1 and is already set to feature artists including Leona Lewis, Chris Martin and Take That. But it remains to be seen whether the stars of the show will be Take That as a four-piece, or as the original five-piece band. 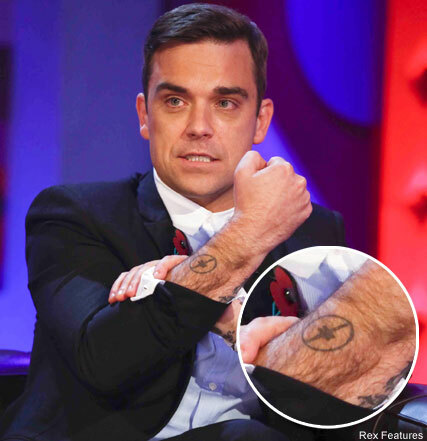 As evidence of his commitment to regrouping with the boys, Robbie revealed a tattoo of the Take That logo during his interview with Ross. He also spoke of his love for his girlfriend, American actress Ayda Field, telling Ross he is coming around to the idea of starting a family. Watch the interview tomorrow night on BBC1.